New season, same struggles. The bullpen stumbled in the late innings and a defensive lapse led to the go ahead run in the 11th inning as the Cardinals lost to San Diego 5-3. A bad cutoff throw by Jon Jay to Ryan Theriot allowed the Padres to score the go ahead run, as San Diego put together three singles with two outs off Bryan Augenstein (0-1) who was chosen late for the 25 man roster. The Cardinals had a 3-2 lead after Matt Holliday homered in the bottom of the 8th. Again with two outs, Cameron Maybin hit a solo homer of closer Ryan Franklin (1-BS) to tie the game. San Diego battled back the whole game. They tied the game at 1-1 after Colby Rasmus tripled and scored on Matt Holliday’s single in the first. Three singles in the bottom of the fourth gave the Cardinals a 2-1 lead as Lance Berkman, David Freese and Yadier Molina strung hits together. The Padres tied the game in the fifth when Chris Carpenter walked Ryan Ludwick to lead off the inning and he scored on a Nick Hundley single. Carpenter went seven innings allowing the two runs on just two hits and two walks while striking out four. The Cardinals had 12 hits, but hit into four double plays including three from Albert Pujols who went 0 for 5 and left five guys on base. 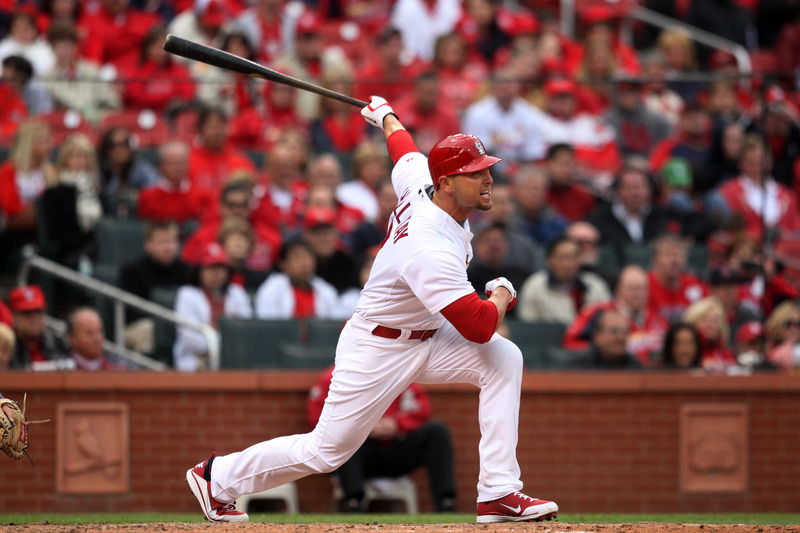 Holliday went 3 for 4 with two RBIs and Lance Berkman went 2 for 4 in his Cardinal debut.